This book is more of a quick introductory guide to watercolours. Publisher Walter Foster partners with watercolour manufacturer Winsor & Newton to produce this book. In more than a handful of times, you'll get recommendations which Winsor & Newton materials to get. Alright, on to the actual content. There are four sections in the book. The first talks about the tools and where you will be working. Second covers the pigments, understanding colour and mixing. The third looks at different mediums to create effects such as granulation, blending, textures and more. The last section is a gallery with text explaining the techniques involved with making the paintings. This book does not teach you how to paint with watercolours. 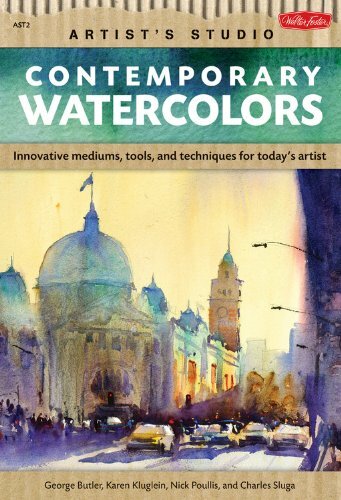 It only talks about the concepts of watercolour painting. For example, it will talk about techniques like glazing, wet-on-wet, gradated wash, but it doesn't really show you how to create them. The step-by-step tutorials in the book only covers creating special effects, e.g. granulation and others. As mentioned, it's really an introductory guide for beginners, those who know absolutely nothing about watercolours. The book has only 64 pages, and it's just slightly larger than A5 size. So it's quite brief. It's probably being reflected by the relatively low price of the book. Personally, I would have preferred a thicker book with more content even if it cost more.